Scores of stars owe their career to late resort-based producer. From child actor to theatre impresario, Duggie Chapman’s legacy will last for generations. Duggie, who died on Saturday morning just a day after turning 81, had produced shows in Blackpool for more than half-a-century. Duggie made his film debut in A Cure for Love at 11 after he was talent spotted in the classroom of his Burnley school. But after failing to make the breakthrough to TV, Duggie retired from frontstage at 23 to forge a career in production. However a late celluloid career saw him appear alongside Likely Lads actor James Bolam in Seaview Knights and as a reporter in Lee Evans’ Funnybones. The many tributes paid to him over the weekend area mark of the respect Duggie was held in. He was awarded the MBE for services to light entertainment and charity by Prince Charles in 2009. 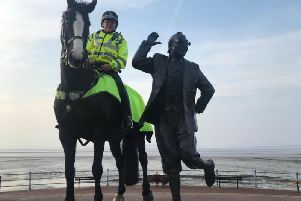 The entertainer, who had lived in the Blackpool area since the 1960s, had been suffering from dementia. Comedian Stu Francis said many people “relied on Duggie” to help them into the entertainment industry. Comedian and panto star Liam Mellor said: “So sad to hear that the guy that gave me my break Duggie Chapman has passed away. Liam dedicated his appearance in Beauty and the Beast at the Theatre Royal St Helens this weekend to Duggie’s memory. Allo Allo star Vicki Michelle described him as “a legend in the world of showbusiness. Did so much for so many people and a truly lovely man”. Ruth Eastwood, manager of Blackpool’s Grand Theatre, said: “Duggie was a really good friend of the Grand, such a generous supporter in so many ways and especially well renowned for his pantomimes and nostalgia shows. Duggie settled in South Shore in 1961 and was responsible for producing some of the best-loved shows in the resort. He booked many seasons for Danny La Rue and funnyman Ted Robbins. Legendary comedian Norman Wisdom was a good pal. By the 1970s he had become one of the UK’s major pantomime producers. At the height of his fame, he was operating eight summer season shows at seaside towns throughout the UK. His show, Chapman’s Music Hall, was continually on the road for more than 35 years. Duggie’s one regret thoughout his long career was the decision to step off stage at the age of just 23. He said: “I made the switch thinking there would be more money in producing, and I had also become disillusioned after doing radio shows and not making it into TV,” Duggie returned to celluloid in 1994 and 1995 in films Seaview Knights and Funny Bones. He said: “I did regret leaving performing when I did those films. “I thought ‘I wish I’d done this ages ago’, and stuck with the performing. Raised in Burnley, Duggie admits he was lucky to have an English teacher who pushed drama to the fore – even though he didn’t quite see the appeal at the time. “I wasn’t fussed about Shakespeare, and used to get all the female parts, like servant to Portia,” he recalls.